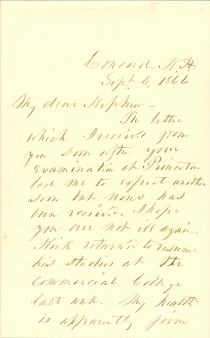 Former President Franklin Pierce worries that young Frank Pierce – like most undergraduates – is occupying himself with things other than his studies at Princeton. FRANKLIN PIERCE. 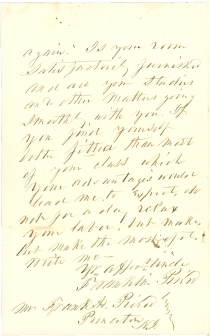 Autograph Letter Signed to Frank H. Pierce, his nephew. Concord, N.H., September 6, 1866. 2 pp. The political reputation of Pierce was fatally damaged by his defense of slavery, his refusal to concede the legitimacy of the Civil War at its outset, and by his continuing friendship with Confederate President Jefferson Davis. He resumed his law practice, but was haunted by his personal and political demons. Pierce, an alcoholic, and his chronically ill wife, Jane, had watched two young sons die before the age of three. Their third, Benjamin, was killed tragically in a train accident a month before Pierce’s inauguration in early 1853. Jane Pierce came to believe Benjamin’s death was a form of divine retribution for his father’s political ambition. In part due to the loss of his sons in childhood, Pierce took an interest in the education of his nephew. Frank became the former President’s principal legatee in 1869 and was himself later a successful lawyer. Franklin Pierce (1804-1869) was the 14th president of the United States (1853-1857). Although his roots and home were in New Hampshire, Pierce sided with the South on the slavery issue, and was criticized as a “doughface” Democrat. Yet Pierce was devoted to the concept of a federal Union, and made his chief aim to uphold the Constitution of the United States as a sacred and therefore unchangeable document and to avoid civil war at all costs. Regarded by history as a weak, but well-meaning and honest man, Pierce left office publicly hated and discredited. 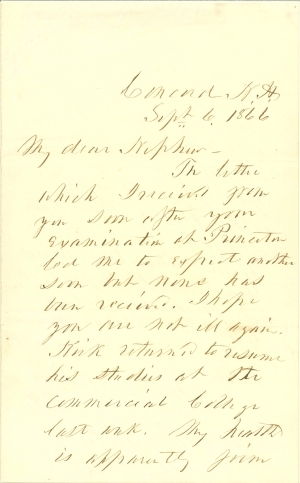 Col. Frank Hawthorne Pierce (1848-1908), was a member of the freshman class when he received this letter. He became the former President’s principal legatee in 1869 (New-Orleans Commercial Bulletin, October 23, 1869) and graduated from Princeton the following year. An alumni catalog notes that in 1873 he received both a Master’s degree from Princeton and Bachelor of Laws degree from Harvard. He served as U.S. Consul to Matanzas, Cuba from 1885-1891 and as U.S. Commercial Agent at Vancouver from 1891-1894. Princeton University was not officially given that name until 1896. For most of it’s prior existence, officially it was the College of New Jersey. Familiar names prior to 1896 include Princeton, Princeton College, Nassau Hall, and simply Nassau. College of New Jersey was Princeton’s legal name during its first one hundred and fifty years. But the College was usually referred to as Nassau or Nassau Hall or Princeton College after it moved to Princeton in 1756. In the 1860s the College baseball team used the name “Nassau”; starting in 1870 all athletic teams were designated “Princeton.” On October 22, 1896, the anniversary of the signing of the College’s first charter, at the climax of the Sesquicentennial Celebration, President Patton announced that “from this moment what heretofore for one hundred and fifty years has been known as the College of New Jersey shall in all future time be known as Princeton University.” - From Alexander Leitch, A Princeton Companion, copyright Princeton University Press (1978).